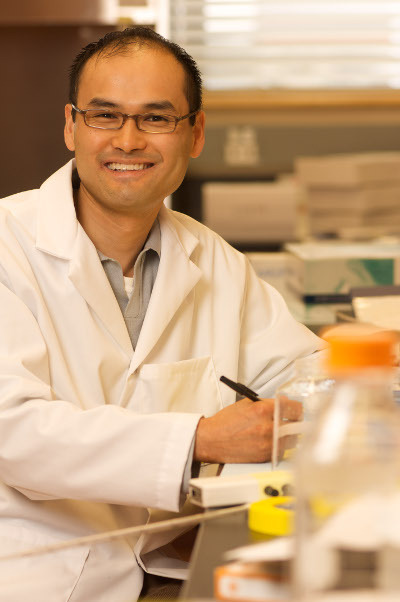 Photo of Dr. Julian J. Lum provided by the BC Cancer Agency. Radiation? An essential tool, but has its limitations. Immunotherapy? Promising, but not necessarily sufficient for every patient. Put the two together though – and there is the potential for a new way to fight metastatic prostate cancer that no longer responds to hormone therapy. And, adds Dr. Julian J. Lum Assistant Professor at the University of Victoria and Scientist at the BC Cancer Agency, this two-pronged approach is likely to be more effective than either strategy on its own. Prostate cancer is the most common cancer in men and the third-leading cause of cancer-related deaths in Canadian men. Tremendous advances have been made in treating prostate cancer. Once the cancer stops responding to hormone therapy and metastasizes, or travels to other locations in the body, however, patients currently have few options. Radiation therapy is a standard treatment for prostate cancer. It does two things. First, it attacks cancer cells in a specific location, in this case the prostate, and kills them. When cancer travels, however, radiation is no longer effective because of its focus on one area. Second, radiation can also stimulate the immune system. But while stimulating the immune system is the basic concept that underlies immunotherapy, the immune response stimulated by radiation is weak and is easily blocked by the cancer cells. Enter Dr. Lum and colleagues. Dr. Lum is an immunologist. He is working in a unique collaboration with Dr. François Benard, Distinguished Scientist at the BC Cancer Agency and a world leader in making novel compounds to carry radioactive materials, as well as Dr. Andrew Minchinton, Distinguished Scientist at the BC Cancer Agency and the head of radiation biology, both at the University of British Columbia. The fourth member of the quartet is MedImmune, the global biologics research and development arm of AstraZeneca, which is contributing research and reagent support to facilitate the study’s progression. Their study, called Targeted RadioLigand (tRL) and checkpoint blockade for metastatic castrate resistant prostate cancer, could provide the option patients need to treat their advanced prostate cancer. “We believe tRLs can amplify the immune effect of radiation,” says Dr. Lum. Targeted RadioLigands are compounds to which radioactive particles can be attached. When injected, they deliver radiation to cancer cells throughout the body, wherever they are found, rather than just in one place. That’s step one. The next step is to inject a compound that will act as what’s called a checkpoint inhibitor, preventing the cancer cells from blocking an immune reaction. That’s the immunotherapy portion. This combination approach is unique, the first study, preclinical or clinical, to test it. The team hypothesizes that each part will be more powerful and effective in combination than either is on its own. Some checkpoint inhibitors are already in clinical use. Dr. Lum’s team will be working to use so-called next-generation checkpoint inhibitor in late-stage cancers. MedImmune will play a key role in developing and testing this new checkpoint inhibitor as it seeks to improve its existing drugs. “MedImmune is a company that understands innovation does not happen in isolation, and we appreciate their commitment to advancing the best in science through collaborations,” says Dr. Lum. The team is currently working with preclinical models to determine how well this two-pronged approach works and what the appropriate dosages are for each. By the end of the project they are hoping to have a product ready for human testing. And, as Dr. Lum points out, if this particular combination doesn’t work out, they can try using other immunotherapy drugs with the radioactive particles. Either way, it’s a novel approach that could potentially deliver major benefits to men with advanced prostate cancer. Heather Blumenthal has been writing about health and health research for more than 20 years and never loses her fascination with the advances Canadian researchers are making.